My oil paintings of pets are whimsical and contemporary. They celebrate our indulgences as pet owners and all the wonderful characteristics that we attribute to our animals. My approach to the botanical paintings is at once escapist and contemplative, I am inspired by the plant’s physical beauty to create symbols of creation and decline. My porcelain work is, in a way, an extension of my botanical paintings: my clay sculptures and functional pieces are a celebration of organic form and texture. It’s nothing but the best for your dog. We use only quality, human grade ingredients. 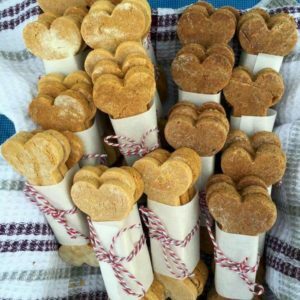 Our treats have no corn, wheat, soy, added sugar or preservatives and contain minimal ingredients. All treats are gluten free and we have grain free options available.